Really? Nobody saw the potential problem? I was browsing the website that lists all the recalls in Canada when I happened on a recall notice for a consumer product that stopped me in my tracks. Now that I'm a father, I spend more time looking at the stuff that we surround ourselves with with a new eye. My research has determined that basically everything will kill your baby. Not only that, but some stuff appears to want to kill your baby. You have to be vigilant, lest some wandering bag of loose buttons should launch itself down your precious child's esophageal tube (that's the throat hole that's connected to the mouth tunnel that everything goes in). Therefore, I now spend time checking the list of recall items to make sure that we haven't brought more danger than absolutely necessary into her life. I say "necessary", because I've placed a series of ingenious traps of increasing complexity and deviousness around the house to teach her to be wary and cunning. Don't tell My Lovely Wife though, because she's an old softy and will probably give RG all kinds of hints. As I was saying, I perused the list of recalls and was stopped in my tracks. I literally could not believe what I was seeing. I even looked around to see if it was a joke or if I was on some kind of hidden camera tv show. That's right. The "My Sweet Baby Cuddle Care Doll". Nobody saw the potential hubris in this? This is why there needs to be more philosophy majors in marketing. This recall involves the My Sweet Baby Cuddle Care Doll. This interactive doll coughs, cries, giggles and gets red cheeks. The face, hands and feet are plastic and the body is soft. The doll is dressed in a pink outfit with green and white flowers and a matching cap. 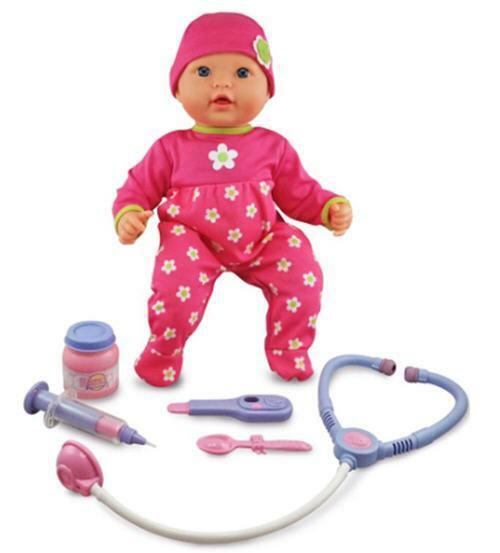 The doll comes packaged with a stethoscope, syringe, thermometer, spoon and medicine bottle. The doll can be identified by the following UPC 628915079777 and Item #30692735. Sounds fine, right? I'm not sure why you would want a doll of a sick baby, I feel pretty strongly that don't want the real thing. Maybe a more accurate name would be the "My Sick Baby Needs Medical Attention", but I guess that doesn't roll off the tongue. The internal electrical components may overheat and pose a burn hazard. 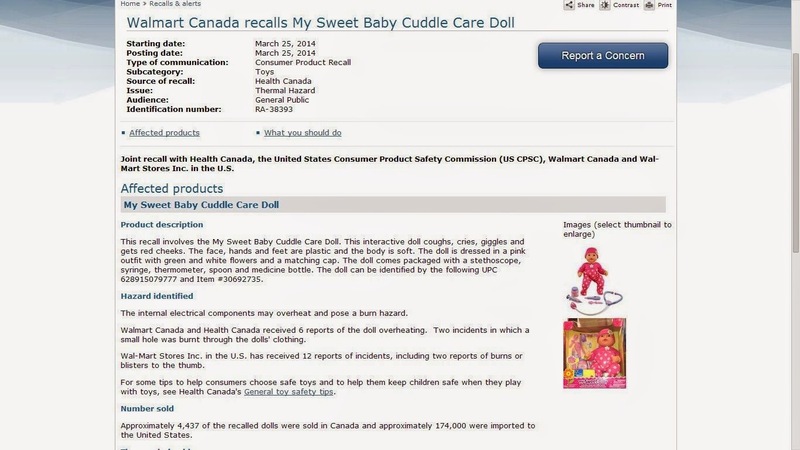 Walmart Canada and Health Canada received 6 reports of the doll overheating. Two incidents in which a small hole was burnt through the dolls' clothing. Oh, and did I mention it looks like this? Also, who packages a spoon and a syringe in a kids toy? And doesn't the point on that syringe look just a little bit too realistic? To sum up: A name that is just a tiny bit too sugary sweet PLUS a tendency to catch on fire PLUS when it does catch on fire there's a possibility that it will be giggling and coughing while staring into your soul with its cold empty eyes? Guess how many people bought one. Approximately 4,437 of the recalled dolls were sold in Canada and approximately 174,000 were imported to the United States. Which means that there are a lot more kids in the US with grandparents that don't quite know what their grandchildren want. You can check out the full page here while it's still available.